Atelier Annie™: Alchemists of Sera Island | NIS America, Inc.
Once upon a time, there was a lazy girl named Annie. To straighten her up, her Grandfather sent her over to an island where a development project was beginning. Annie must participate by using alchemy, which she's never tried before. What kind of life will she face on Sera Island!? ©GUST CO., LTD. 2008-2009. 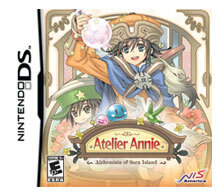 All rights reserved.Licensed to and Published by NIS America, Inc. Atelier Annie is a trademark of GUST CO., LTD. Distributed exclusively by KOEI Corporation.Nintendo DS is a trademark of Nintendo. © 2006 Nintendo. The ratings icon is a trademark of the Entertainment Software Association.